Memorial Day is almost here, which means a return to wearing white, especially if you adhere to tradition. After this long, cold winter it’s time to put away your heavy sweaters and coats, and welcome in bright white. The NUE by Shani collection offers dresses with built-in shape wear to create the illusion of wearing a smaller size. The “botox for your body” compression fabric allows women to accentuate their best features and camouflage problem areas discreetly and stylishly. If you’re afraid to wear white because it makes you feel heavy, these two flirty styles are the perfect solution. Memorial Day weekend is the ideal opportunity to debut white as the new slimming color. Thanks to NUE by Shani’s exclusive body architecture, you can flaunt your figure with confidence. If you are interested in white fashion, you may want to read the white tees article recently posted on the Fashion Salad blog. 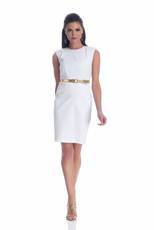 This entry was posted in Clothing, Shopping and tagged ottman knit dress, sheath dress, sweetheart neckline, white clothing, white dress, white fashion, white tees. Bookmark the permalink.